The most definitive comprehensive “how to” guide for service of process in California, including updates through 2016. Statutes and leading court decisions governing service of process are cited for quick reference. The 5th Edition is expanded to include a more detailed discussion on trespass, and we have added a table of cases, statutes, rules of court, and regulations, and a list of all California process serving statutes. We have described the requirements for serving a trust, based upon a recent appellate court decision. We cover service on a prisoner in jail, state prison, and federal penitentiary, a person in the military, someone served in a foreign country and on tribal lands. It also describes the changes to the California notarial wording required for notarized affidavits of service. It also addresses service by court order, fax, publication, e-mail, and out-of-state defendants. Included are updates from 2008 to 2016, which cite the appellate decisions and amendments to the process serving statutes. New updates to all of our publications are available at the annual “What’s New for Process Servers?” dinner events which are held every January in the Bay Area and Los Angeles and another city in Central or Southern California. The guide is written for the process server, office staff, and attorney service owner who wants to serve process correctly and with confidence, and to build or expand a new or existing process serving business. This book is also for a person or law firm that retains a process server to provide proper service instruction. 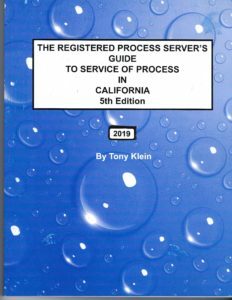 The Registered Process Server’s Guide to Service of Process, 5th Edition is available for review and sale at our process serving Seminars and Events. The book with the current update retails for $63.00 ($50.00, plus tax and shipping). It is supplemented with the Affidavit and Proof of Service Requirements Guide that provides exemplars on how to complete proofs of service and retails for $46.25 ($35.00 plus tax and shipping). The Registered Process Server’s Guide to Service of Writs of Attachment and Writs of Execution, 3d Edition covers the service of pre-judgment and post-judgment writs, and retails for $63.00 ($50.00, plus tax and shipping). When you purchasing all of these books, you will have to the most comprehensive collection of process serving books at your ready reference. All books purchased with the same order qualify as a multiple purchase and are discounted 10%.